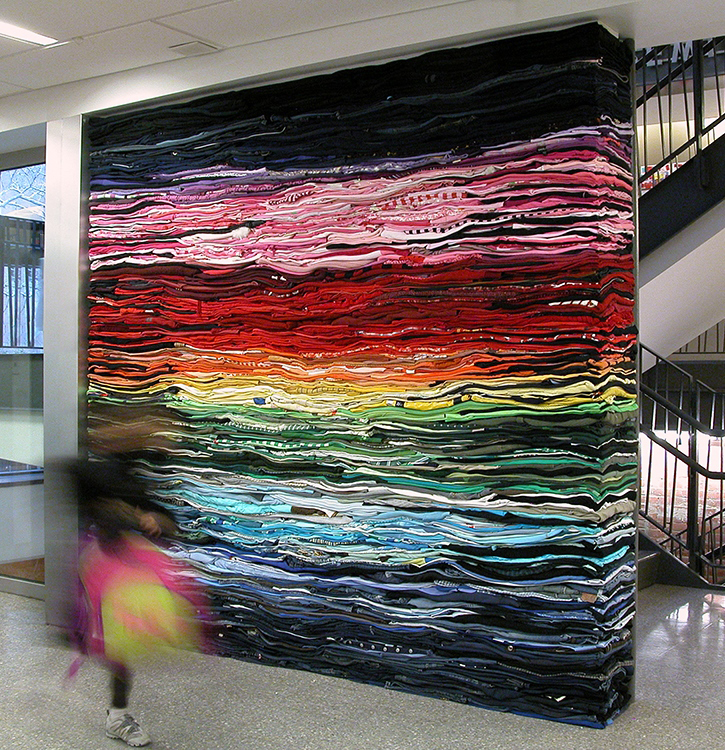 The Rijswijk Textile Biennial is more important than one would think at a first glance. In spite of the small number of 19 selected artists only, there were 300 applicants from all over the world and a very well-informed jury taking the decisions. Furthermore Dutch textile art is seen as a trend setter on an international level, a fact that the Rijswijk Museum always has been very well aware of. A huge pile of discarded clothes has swallowed up the historic furniture in the study of Museum Rijswijk, where 19th-century poet Hendrick Tollens once worked. This installation by Derick Melander is representative of the 4th Rijswijk Textile Biennial: textile that looks beyond its own material. 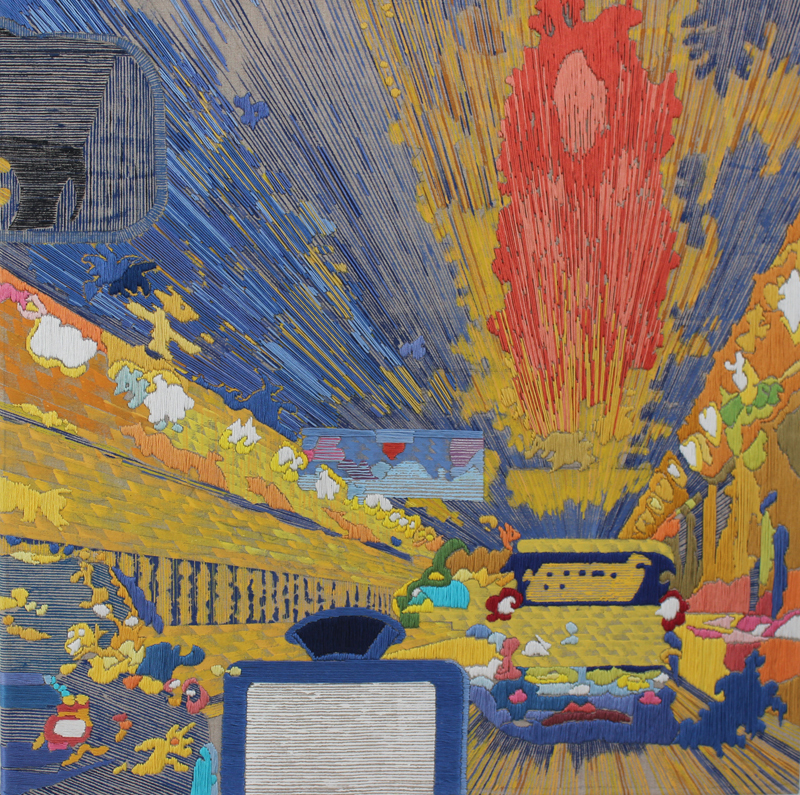 Museum Rijswijk is showing textile artworks by nineteen international artists. Apart from the great diversity of textiles and applications, there are also conspicuously common threads among the participants this year. The most important one? All the submitted works provide material for thought and reflection. Textile inherently appeals to the touch. Sensations and associations are evoked at the touch and sight of particular fabrics. Vintage clothes and hand-crafted pieces, that only a couple of generations ago were made in every household, conjure up memories of particular people or times. Making one’s own clothes, embroidery and knitting are no longer a natural part of daily household tasks and techniques are being forgotten. 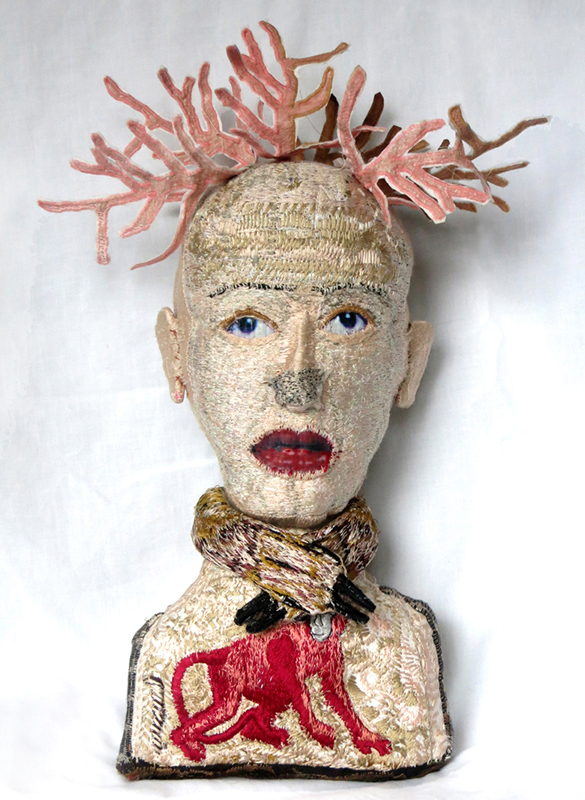 This is not the case for the 19 international artists of this 4th Rijswijk Textile Biennial. Vintage textile, wool, embroidery floss and flax are used in combination with techniques such as weaving, cross-stitching and knitting to conjure up loving memories, melancholy or even alienation through a contemporary idiom. 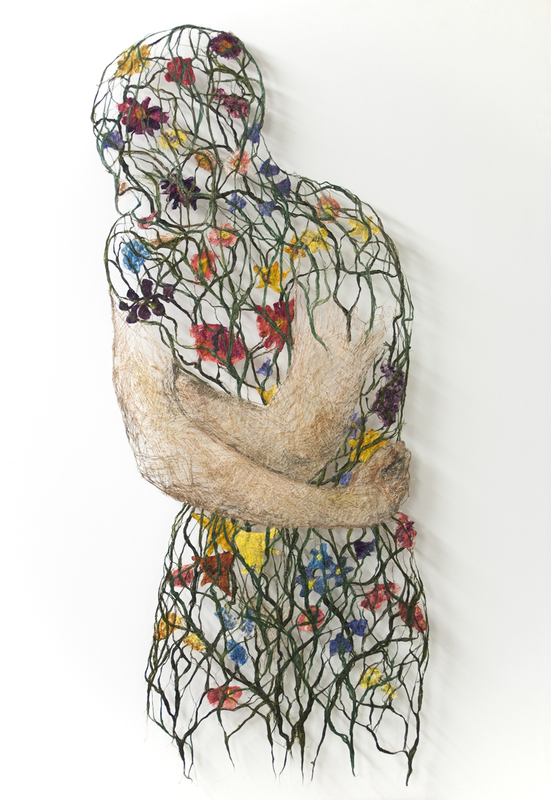 In Kari Steihaug’s work old clothes and their previous wearers are reunited. 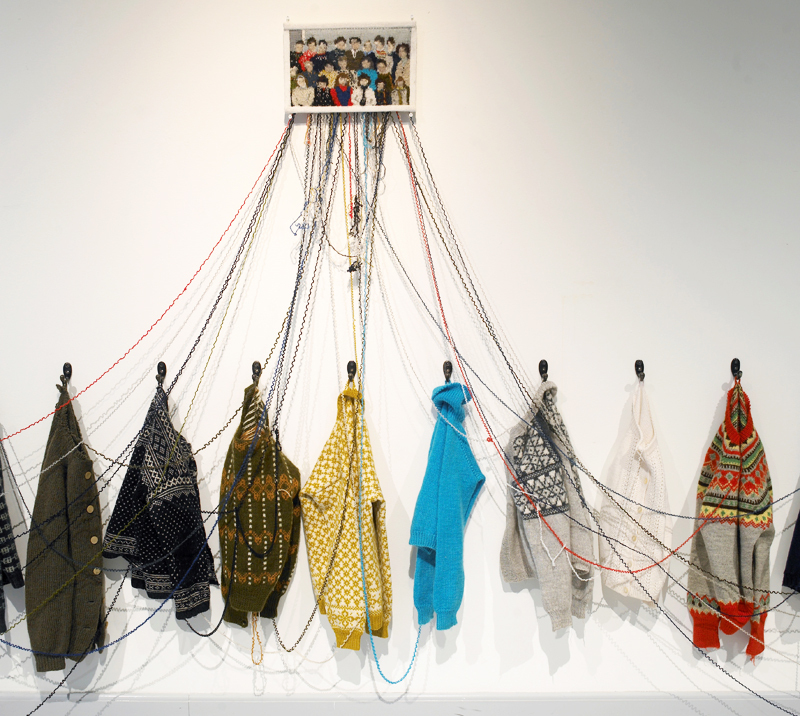 She partly unravels knitted Norwegian jumpers and with the freed yarn knits a group portrait of those who have worn the jumpers. The fragility of our existence is central to Ying Chew’s work. 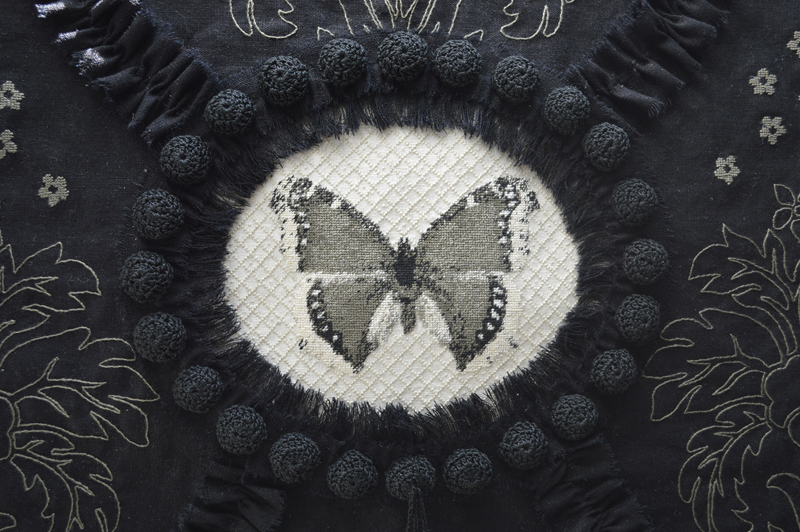 She uses embroidery techniques and Victorian mourning motifs to give the viewer cause for thought. 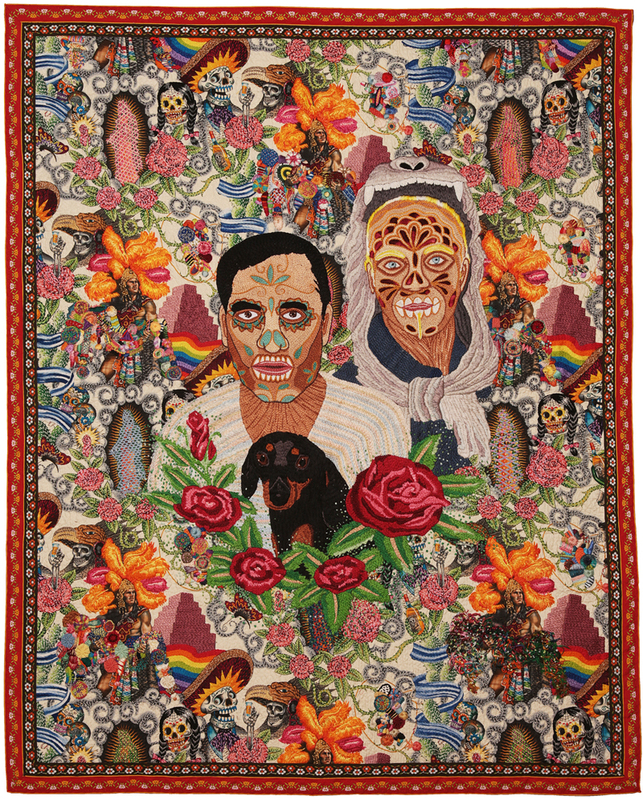 With imagery and techniques rooted in Latin American folk art, Leo Chiachio and Daniel Giannone make large tapestries that portray themselves (with their Dachshund Piolin) in worlds of dreams, myths and legends. An illustrated, full-colour and bilingual (Dutch/English) catalogue of the works of participating artists is accompanying the Textile Biennial. Author of the catalogue is art historian Frank van der Ploeg. ISBN/EAN 978-90-821807-3-2. Retail price: € 19.75. On Sunday 13 September from 1 to 5 pm there will be a big textile market in the forecourt of the museum and in the Oude Kerk opposite the museum.